Water is vital for the survival of all living organisms. When water is short, or stored and used for multiple purposes, the river diverted and the wetland modified, or chemicals and other substances added, fish are the first to be affected, because they live in it. Fish are vital to our good health and survival. We need the protein, essential oils and vitamins, the mosquito control and the sport and recreation that fish provide. Fish maintain the balance in and are excellent indicators of a healthy aquatic ecosystem. Fish ecology is the study and knowledge of these interactions between fish, humans and the aquatic environment, and Alf Hogan has over 30 years of experience in this field. 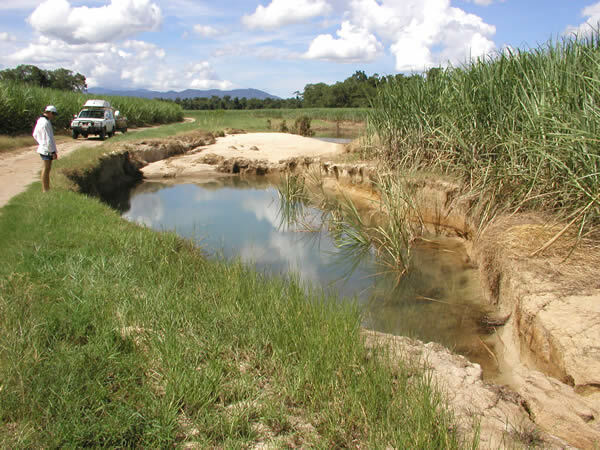 If you need to find out what species of fish and aquatic macroinvertebrates are in your catchment, surrounding your mine site, your potential dam site, your shire, your real estate development or conservation park, then Alf Hogan and his associates can help you. We have a range of services that will help to manage and improve your aquatic biodiversity and associated habitat and meet any statutory requirements you may have. We often work as part of a multidisciplinary team of natural resource scientists, so can provide a complete and integrated environmental management package. Please browse through some of our recent publications and if you need further information on these or any project you are considering, don’t hesitate to contact us. Note we have a reputation for professionalism and maintaining client confidentiality and we are determined to keep it that way. We are prepared to go anywhere, although we have specialised in the remote areas of tropical Australia. See us at work in the gallery and if you are in a dull city office and dare to dream about visiting some of the magic places we have been to, grab a few fishing tips and just go!